With the increasing popularity of self-installation hardwood flooring, homeowners find themselves wishing they could match their staircase to their new floors. Tearing out and replacing a stairway with hardwood, such as oak, can be extremely expensive, but a cost-conscious alternative is now marketed that keeps project costs at a manageable level. Although the range of factors that influence cost make it impossible to arrive at a true average, a number of considerations are common to all such projects. Beautiful oak staircases can now be enjoyed at a fraction of the cost of complete replacement. 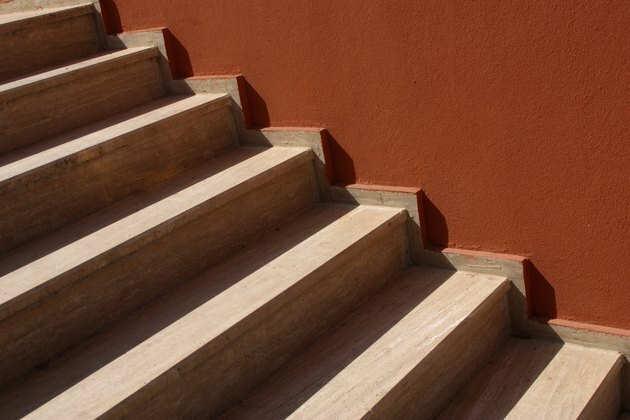 The rehabilitation of formerly carpeted or vinyl-clad stairs has been made relatively easy with the advent of proprietary stair tread covers, properly called "recapping treads." These have become so popular that the least costly method of building a grand hardwood staircase from scratch is now to construct it using only construction-grade lumber, then cover the exposed surfaces with a more glamorous wood. The same effect is achieved at a reduced price. Traditionally, treads have been made from 1-inch lumber; recapping treads tend to be less thick to preserve the original look as much as possible. Matching material is available for cladding the risers -- the vertical panels between the treads -- and the stringers, also called side timbers. All these products have been designed with ease of installation in mind, so most competent do-it-yourselfers are able to rehabilitate a staircase without problems. Because professional help or technical guidance is not required, it keeps the cost of the project down considerably. At time of publication, Internet vendor Stair Treads (stairtreads.com) lists its most popular 36-inch-by-11 1/2- inch, 3/4-inch-thick red oak unfinished stair tread at $27.13 per tread; the company defines "unfinished" as "sanded and ready for you to apply stain and polyurethane." It lists a finished version of the tread at $41.46 per tread; "finished" means the item is offered in a number of stains and is coated with polyurethane lacquer. Another Internet company, NuStair (nustair.com), offers similar products to those sold by Stair Treads, but with a thinner tread cap that leaves the riser height closer to the original. The nosing on the leading edge of its product is bonded in place, rather than being part of the original hardwood lumber. Both these factors result in a reduced cost to the homeowner. NuStair stocks its product in unfinished, Brazilian cherry, butterscotch, gunstock, maple and natural red and white oak, all in a choice of five lengths.